About eight years ago I went through a stage of often wearing A-line dresses or fitted shirtdresses over skinnies and clamdiggers. After a long break from the combination I started wearing it again last year, both for casual and dressy occasions, and am back to enjoying it enormously. I’ve updated the vibe by pairing my frocks with cropped straight or flared jeans, or cropped trousers to showcase the ankle. Visually, I ADORE the pairing of these silhouettes. A little avant-garde, modern retro, dramatic, elegant, and thoroughly modern. Practically, I find the pairing extremely comfortable because I can get more use out my dresses by extending them into cooler weather. Also, I prefer wearing structured jeans and trousers to leggings or hosiery. The combination works best with dresses that are fluid or oversized on the waist, and slightly roomy in the hip area to prevent bunching, clinging and gaping. High-waisted bottoms work well because they girdle the midsection and allow the dress to lay flat. Empire cut dresses generally work well because they’re roomy from cut line to hem. Here are five easy ways to pair dresses with trousers and jeans with an accompanying visual. Use the photos as inspiration to create combinations from your closet, or to shop from the retailers where you prefer to spend your fashion dollars. Combine a silky shirtdress or shift dress with dressy black cropped straight or flared trousers. Adding a self-tie or belt on the natural waist of a roomy shirtdress works well over high-waisted bottoms because the waistlines are in the same place. Add dressy footwear that works with the length of the trousers. There is no need to wear high heels. The sack dress here is very long and voluminous, but that’s not essential. Feel free to sport a much shorter dress that’s not quite as roomy. High heels temper the volume, as does wearing cropped pants with narrower hems. Casual draped dresses need to be roomy to wear over jeans or trousers so that they don’t cling. Here, the high-low hemline adds visual interest, and the scrunched skinnies are a nice blast from the past. I love that comfortable flat slip-on sneakers were the choice of footwear. Pop a denim jacket over the top for warmth, and Bob’s your uncle. Combine a casual linen or cotton shirtdress with cropped skinny, straight or flared jeans. Finish off the look with sneakers, casual flats, or sandals. Or combine a blue denim shirtdress with white or black jeans. Scrunch the sleeves and pop the collar if you like. Unbutton a few of the buttons at the bottom of the dress so that you can stride at a fast pace. Long side slits make this a tunic and not a dress. Pop a long tunic over cropped jeans with staggered hems and add block heel sandals. Dressy cropped trousers are just as fab. Create a column of colour under the tunic with a tank top or camisole if it’s see-through. I haven’t included a visual, but full-length bell-bottoms or bootcuts with a bit of a heel can work well with a dress or long tunic. It’s a very elegant look, so give that a go if you’re game. You don’t need to be tall to wear this combination. Petites simply need to adjust proportions so that the lengths of the dresses and tunics aren’t too long. I wear #1 and #4 frequently. Here are the exact dresses and cropped jeans and trousers from my wardrobe that I pair together to create my versions of the vibe. I finish things off with a dressy low heel, loafer, or flat pair of sandals. Good ideas! I have a short sleeve silk shirt dress that I enjoy wearing with my cropped jeans. I love love love this look! I am wearing it today, a wrap dress over ankle crop jeans. This looks fresh again! Love that flat shoes are an option. I especially like the sack dress and draped jersey dress versions and will see if I can shop my closet for something similar. 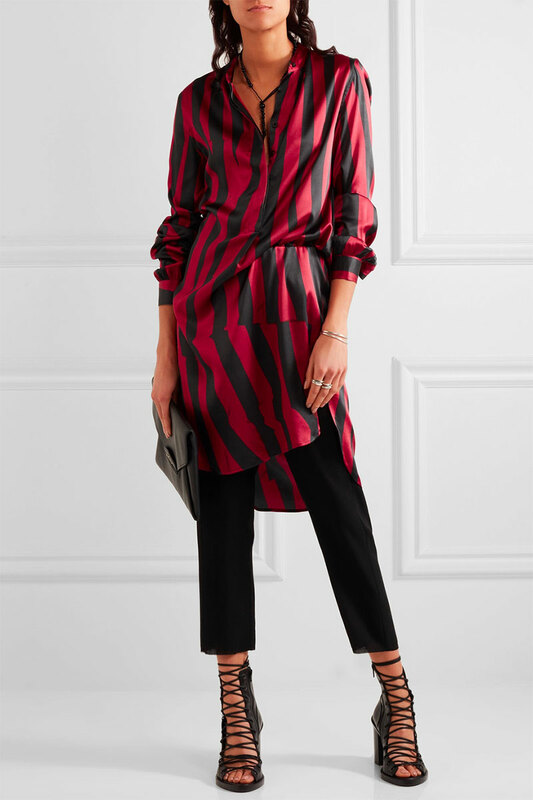 The shirt dress or tunic, with slim bottoms appeals to me most. This is one of my signature looks that I wear a lot. In winter I also wear sweater dresses this way. Shirt dresses are the easiest dresses for me to wear this way (so #1 and #4), but I’d love to try and wear some other dress types like this, too. Angie, what do you think of wearing classic wrap dresses this way – does the waist definition make the combo more fussy and there are more things to pay attention to? I have also noticed that this season all the dresses worn this way or longer -knee length or even midi, and suddenly wish all my dresses are longer, too. I have bought one new dress specifically to wear this way – it is a knee length shirt dress with a wide waist-defining sash and I should give it a spin today. I like this look so much that it has me back in dresses again. My two favorites here are the dressy sack dress (love the bit of sheerness over pants) and the tunic with the staggered bottoms. This look dresses up or down, is comfortable and eliminates the fussiness of wearing a dress. I am all in! I haven’t worn this look in years, but a long time ago I used to wear a too-short dress over full-length bootcut trousers for a tunic-effect look. I enjoy it if the pieces are *just* right. I love that first photo and would wear that if it were in my closet. 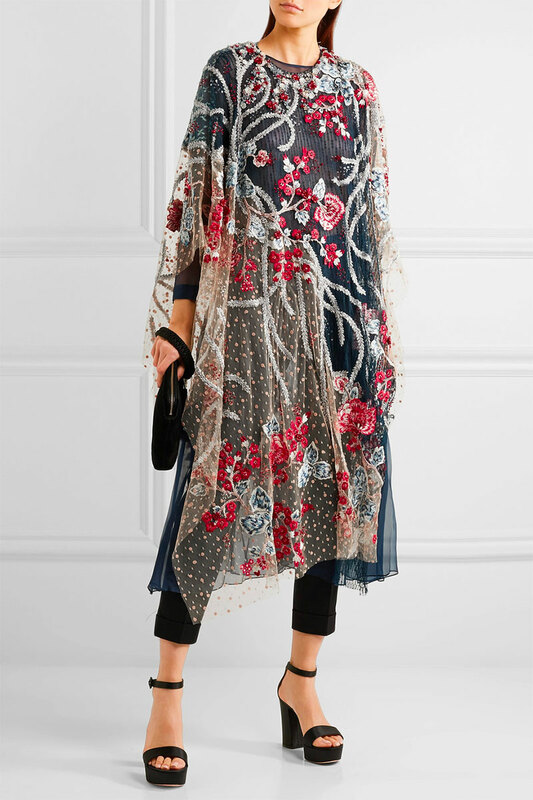 It basically boils down to wearing a dress as a tunic, which I have been keeping in mind when I see all the dresses out there that are just too short for me (which is about 95% of them, it seems). However, we don’t have much of the moderate, in-between weather that makes this combination wearable for much of the year. We quickly go from winter to summer! That first one is beautiful. I am with Janet on the weather. We rarely get the moderate temperatures that make this a just right combination. I have worn my Vince silk shirt dress with cropped flares, though, and have also tried my chambray shirtdress with white crops. So, like you, I tend towards silhouettes 1 and 4. After all these years, I still have a poison eye for this look. It reminds of the clothes my peers from very traditional, conservative, religious families wore when we were growing up. This was a way to marry modern trends with requirements of modesty (which sometimes were not their own choosing). I don’t think I will ever get over this association. I like some renditions, but I don’t think I will ever wear it myself. I love this look and wear it often. Recently have re-discovered how cool a long, knee or midi-length tunic or dress looks with flares and wide leg pants just skimming the floor. I’m glad to see that has Angie approval too! Thanks Angie for the styling tips for waistlines and footwear! Mostly this style outfit that I’ve had in mind has been returned to the store. Maybe I need to concentrate on more casual versions like 4 or work to get proportions right. As Janet points out, climate can be a problem, but I have done this with sweater dresses in winter. I did buy a sleeveless dress to wear over cropped jeans this summer but have not tried it yet. I love the look of all your examples and want to make this work. This is one of my all-time favorite silhouettes. I’m always wanting to add more dresses to pop over pants. I have one version I’m currently wearing, a loose chambray shirt dress (kind of a line, like a smock, but with structured shoulders and collar). I wore it this week with cropped flares and flats — a little JFE, but also more fund than with straight up leggings. I’d like another dress good for layering, since it works so well with my job. Sometimes when I sit on the floor with a client, I need to be wrangling the instruments, too. This is the only way I’ll get to wear dresses! I’ve always loved this look and never stopped wearing it. I’ve not tried the shirtdress version yet and am inspired to see if it’ll work with my orange shirtdress! Love every single look you’ve shown. It’s not one I get much chance to wear for weather related reasons mentioned earlier, but today just might be perfect for it. I’ll see what I can come up with! Well, after our mini heat wave this looks too warm! Aside from that issue, it seems like the jeans would be too bulky under all but flowiest dresses, for a pear shape like me. Thanks for the thoughts, ladies. Nice to hear that there are takers for the combination. Inge, you can wear your new H&M dress over cropped straights or flares. Nice for Fall with the halogen black kick flares. Laura, it DOES look fresh, doesn’t it. Eliza and Diana, go for it. Tanya, there might be a problem with the cling factor. Wrap dresses are tight on the torso, and you don’t want the bottoms grinning through. But try the wrap dresses with high waisted bottoms so that the waist lines are in the same place. YES, the longer dresses look great worn this way – and I can’t wait to see your new frock. Janet, I’d like to see you sport the vibe with full length bootcuts. Suz, wait till you move West. THEN you’ll sport the look a lot. Beth Ann, stylish AND practical. Perfect. The weather is not a problem when you sit in a/c all day, or run cold. Lisap, have fun putting together your look. JAileen, you're not pear shaped. It’s weird that you write about this exact silhouette around the time I start thinking longer tops/tunics (knee length) are good. These ideas are giving me great inspiration. I was stuck, because I was thinking”top” and “tunic”; if I add “dress” to the search terms, I can probably find so many more options! Thank you! Angie I did this very look for the first time yesterday! Actually my inspiration was your denim ensemble post, I just tweaked it a bit. I wore my new J Jill denim dark wash shirtdress with crop skinny dark jeans. I topped it with a cute 3/4 sleeve dark blue tee shirt and wore the shirtdress unbuttoned with the sleeves rolled up. I paired it with dark gray Toms slip ons and a quilted navy Lug bag. It was cool yesterday and this outfit worked perfectly for the temperature. I love to wear all one tone as I think it helps me to look taller. So happy that I came up with a look that is Angie-endorsed! Thank you! All are very nice but I like #1 and #4 as I am petite. It is a good idea to wear dresses more, not only for hot summer day. Thanks for this post. I find this look tricky, because on most of the days that I would wear it, I would also need a jacket or coat, which makes the whole thing more difficult. 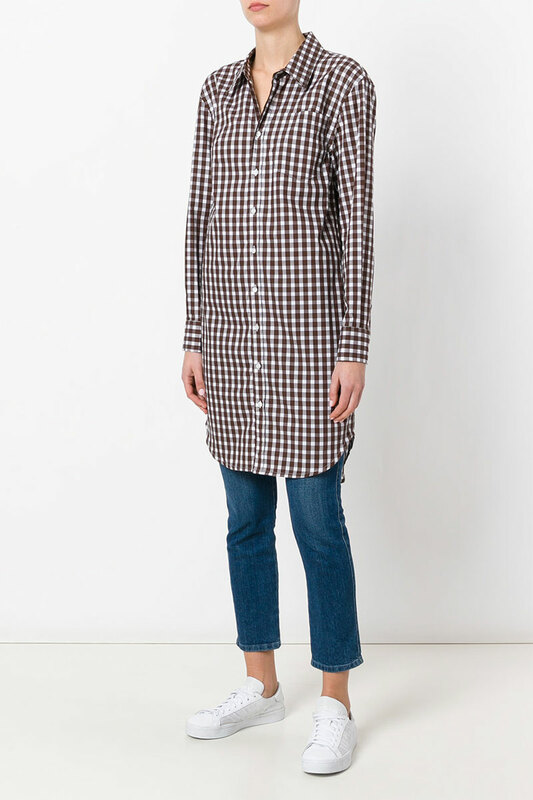 I like the shirt dress and cropped pants look very much and would wear it if I happened to have the right pieces. So far I’ve abandoned my own attempts for comfort reasons. As you point out there has to be enough room in the hips for this to work. My dresses aren’t roomy enough I think, because I’m self conscious about that area and usually choose not to have much extra volume there. Even though I admire this look on others I have never been drawn to it for myself and I am not really sure why. 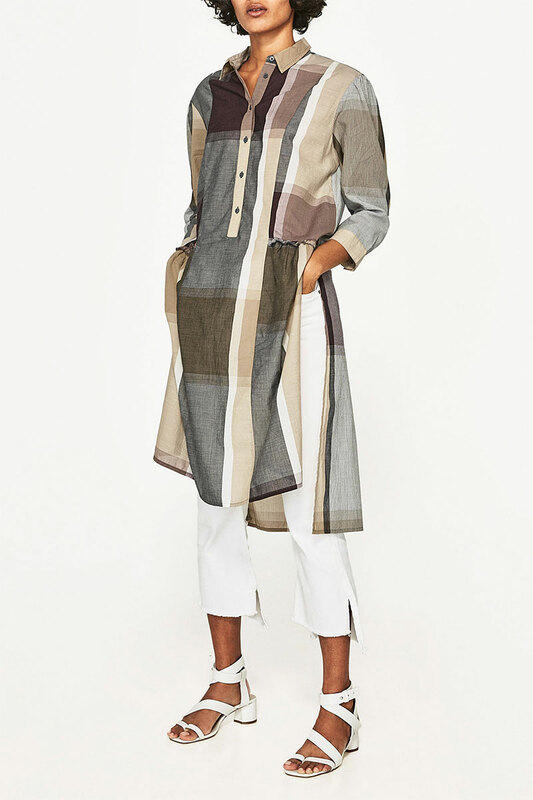 I love tunics over pants, but haven’t tried this silhouette yet. I need to give this a try. I like this look and wore it in high school (early 70s). I have one tunic, short dress that works well with flares and I wear that on occasion. I do find the weather stops me from embracing this look more. A shirt dress over jeans is one of my all time favorite outfits. I’ve adapted it as trends change – 5 years ago it was usually belted over tight skinnies. Now I sometimes go for an unbelted dress over cropped straight / bf jeans, though legging jeans are still useful for this too. I haven’t tried it with my new wide leg jeans – I think it would be a little more 70s than my taste – but we’ll see. YAY. I’m enjoying the enthusiasm. (It’s hard for me to get my head around the weather issue which many have mentioned. I guess I take my resistance to the heat for granted). UmmLila, a long trench or coat or tonal jacket works well with the vibe. A denim jacket too. KCourney, so you wore the dress like a jacket? I really like this look and wore it a little about 8 years ago. I have been meaning to try a combo I think may or may not work, but it’s a wrap dress…doesn’t really follow your rules. However. the pants are more like woven leggings (no button/zipper). I’m hoping it will dress down the dress a little so I can wear it more. Thanks! Love dresses 2 & 3! I love dresses over pants because pants are so much warmer than hose! So many fun possibilities. Thank you. I especially like #1 and #4! I’ve been accumulating shirtdresses and occasionally wearing them that way. (And after spending decades wanting to emphasize my waist with a belt when I wore a loose dress I now find that I prefer the uninterrupted long line of a shirtdress without a belt.) I’d wear this look more often but when I pull out a shirtdress I often succumb to the temptation to throw on a camisole or tank and wear the dress open as a jacket. Sometimes I can match the color of the top and the jeans so I’ve got a column of color going underneath the shirtdress (and no interruptions to the long lines). I love this look – shirt dresses with a slim pant is one of my go to looks. Hope this never goes out of style! For the most part I do not care for this look. It seems odd to me to put a pair of pants under a dress. Perhaps some of that is due to my growing up and living in Southern California, where it’s warm most of the time. There are exceptions from time to time, such as #1. I like the silk dress and overall dressed up look. Unfortunately this is not a flattering look on me. I associate this look with someone who is tall, thin and little to no curves. Otherwise it just doesn’t work to my eye. I lke all these looks too. It is not a look I have really tried much but I do have a couple of pairs of perfect cropped pants. I like the length of these tunics or dresses too – elegant and sophisticated, fashion for “grown ups”. I am not a fan of this look. I like tunics, but not dresses over pants. If the dress was short enough (which a lot of dresses are) and I could think of it as tunic length, I might try it. I’m quite liking these looks, especially #1. I plan to try my too-short embroidered shift dress over some flares. It’ll be quite the 70s vibe, but it might be a fun change. The only rendition I’ve tried so far was a bohemian style dress with an empire waist over some cropped skinnies. I really enjoyed that silhouette and plan to repeat that this summer. The looks you’ve shown seem more modern and avant garde than the looks I would likely create, but they’re fun inspiration! Yes, like a long jacket, but I will try the buttoned up or partly buttoned up version also.I would like to find a square neck scarf to add to the outfit. I repeated it again today for a lunch outing! Love this look and wear it all the time–at least until it gets too hot to do so. mtnsofthemoon and Karie, I wonder if you’d like the combination if I came and styled you in it. You might! Sounds fab, KCourtney. Hope we see the outfit on the forum. I’m so short I’ve never tried this concept. Trying to get the 2/3, 1/3 proportions right is difficult when you are petite and top heavy. You have inspired me to play around in my closet to see if I have any potential looks that would be flattering. I just love these examples and I think I have been wearing variations of this for too many years to count lol. I would consider dress / tunic (tunics re often dresses on me because I am short ) over pants part of my signature. That very ornate oversized dress you have shown is now on my ‘to die for’ list lol. Love all of these examples and this has become my preferred solution to dresses that a bit shorter than I like. I’ve never worn this, but I like the way it looks. Hmmmm. It might be a fun shopping goal to try this on. I would like to try this over my crop flares. I doubt I could do it in warm weather, at least not during the day. Too many layers for me in the heat. But I could try it for cool weather with boots and a trench. Thanks for the inspiration. How funny! Wore a navy blue + white gingham check linen shirt dress over coated navy skinny leg jeans + a fine merino wool turtleneck today (autumn here in Australia!) with black + white slip on sneakers and then came home to read today’s blog! You mean my new COS dress, Angie? And yes! Love the idea of pairing it with the Halogen kick flares for Fall. Fun! I like These Options here! I’d like to wear Pants under my A-Line-Dresses as well, but this might be a bit too much and not such a good idea. I spot some oriental Inspiration here, where Kaftans and tunics get worn over wider Pants. I think this is a great way to wear Dresses when it’s a bit chilly, but unfortunately my social surrounding doesn’t seem to approve this idea – sadly! Fun to hear more takers for the combination. Wooohooo. *slaps forehead*, YES, Inge. I mean the COS dress. I love this look and wear it frequently – I recently bought two longer dresses/tunics from Everlane (indigo linen and striped poplin) to wear on their own and also over skinny jeans. Both have long sleeves but I expect to wear them even through the summer. Although it can get hot during the day, I always freeze in the summer: airports are cold, hotels are cold, stores are cold, and in Maine, the evenings are cold. I really abhor air conditioning, but it’s everywhere in the summer, so I like having the option of more coverage. Also, once i have gotten a little color from the sun, I like being able to cover up and interrupt the process. So I think this is a year-round look for me. I’d love to have a version of #1 for dressy (I’d actually like that exact dress), but what I wear most of is #4. Oh I defintely love this! It’s a silhouette that I wear often on the form of leggings, but I have been feeling less like wearing the leggings and didn’t know why. I think that exchanging them for a more modern pant silhouette would do the trick! My only hesitation is that it will add to the warmth, and that’s not something I need… I’ll have to do some playing in my closet! Thank you for the ideas and the explanations! Oh, how could I missed this post? Love nr 1&4, but never quite worked for me as need to emphasize a little bit of waist for flattering (and belting on a doubled waisted outfit is a mare on me) -but am IN LOVE with the last one- the intentional grinning and some long side slits make all the difference! Wow! mtnsofthemoon, I look forward to styling you one day. Inge, love this look on you. Thanks for your thoughts, ladies. I guess in a fringe way to create an outfit. I wore the combination yesterday with striped linen shirt dress and cropped white straights, and loved it. I am a big fan of this combination. I find at least one excuse to wear it every summer, so thank you for providing yet more excuses. Also: them’s my shoes in #1 (as enabled by YLF). What a timely post! I recently lost a lot of weight (illness), and gave away all my shaped and knit dresses because they looked weird on me; they just looked like sacks. But a loose tunic looks fresh and modern over cropped trousers and jeans, especially in my tropical climate. Thanks for reminding me of this great idea!